Alastair Humphreys: Ian Hibbell's obituary. A life well-lived. Ian Hibbell's obituary. A life well-lived. IN A man’s life there comes a time when he must get out of Brixham. He must leave the boats bobbing in the harbour, the Devon cream teas, the holiday camp and the steam railway; he must bid farewell to the nine-to-five job at Standard Telephones and Cables, up the A379 in Paignton, and hit the more open road. Some might get no farther than Bristol. But Ian Hibell went so far in one direction that his eyebrows crusted with frost and his hands froze; and so far in another that he lay down in the hot sand to die of dehydration (as he expected) under a thorn tree; and so far in another that the safest place to be, out of range of the mosquitoes, was to burrow like an alligator into black, viscous mud. In the course of his 40-year travelling life he went the equivalent of ten times round the equator, covering 6,000 miles or so a year. He became the first man to cycle the Darien Gap in Panama, and the first to cycle from the top to the bottom of the American continent. He went from Norway to the Cape of Good Hope and from Bangkok to Vladivostok, wheeling or walking every inch of the way. Every so often he would come back, showing up at STC (from which he had taken, in the beginning, only a two-year leave of absence) with vague murmurings of an apology. But pretty soon the panniers would be packed, the brakes checked, the tyres pumped, and he would be off again. His cycle, loaded with 60-80lb of clothes, tent, stove, biscuits, sardines and water, was sometimes a complication. In the Sahara it sank to its hubs in fine, talc-like sand. In the Amazonian jungle he could not squeeze it between the trees. Crossing the great Atrato swamp, where the track became a causeway over slimy logs and then a mat of floating grass, the bike would sometimes sink into nothingness. He became expert at feeling for it in the morass with his feet. Every tricky traverse in mountain, stream or forest needed doing twice over: once to find a way for himself, then to collect the steed, often carrying it shoulder-high through sharp palmetto, or water, or rocks. Yet Mr Hibell’s love for his bikes was unconditional. He took them, muddy as they were, into hotels with him, and clung fiercely on to them whenever tribesmen robbed him of the rest of his things. His favourite had a Freddie Grubb frame of Reynolds 531 tubing on a 42-inch wheelbase, reinforced to take the extra weight of goatskins holding water; Campagnolo Nuevo Record gears front and rear; Robregal double-butted 14-16-gauge spokes; and Christophe pedal-straps. It was so lightweight, as touring bikes go, that a group of boys in Newfoundland mocked that it would soon break on their roads. Instead, it did 100,000 miles. Bikes rarely let him down. Escaping once from spear-throwing Turkana in northern Kenya, he felt the chain come off, but managed to coast downhill to safety. He crossed China from north to south—in 2006, at 72—with just three brake-block changes, one jammed rear-brake cable and a change of tape on the handlebars. 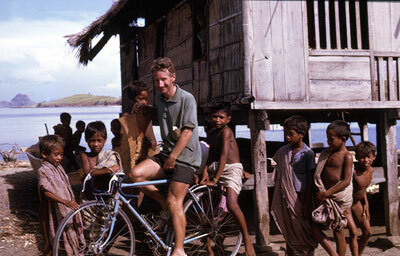 In his book, “Into the Remote Places” (1984), he described his bike as a companion, a crutch and a friend. Setting off in the morning light with “the quiet hum of the wheels, the creak of strap against load, the clink of something in the pannier”, was “delicious”. And more than that. Mr Hibell was a short, sinewy man, not particularly swift on his feet. But on a good smooth downhill run, the wind in his face, the landscape pelting past, he felt “oneness with everything”, like “a god almost”. Human company was less uplifting. His travelling companions usually proved selfish, violent and unreliable, unappreciative of Mr Hibell’s rather proper and methodical approach to putting up a tent or planning a route, leaving (sometimes with essential kit) to strike off by themselves. But there were exceptions. One was the beautiful Laura with whom, after years of shyness towards women, he found love as they skidded down rocky tracks in Peru. Others were the strangers whose kindness he encountered everywhere. Peasants in China shared their dumplings with him; Indians in Amazonia guided him through the jungle; and in a wilderness of sand a pair of Tuareg boys produced from their robes a bag of dates and a small blue teapot, which restored him. In a career of hazards, from soldier ants to real soldiers to sleet that cut his face like steel, only motorists did him real damage. The drivers came too close, and passengers sometimes pelted him with bottles (in Nigeria), or with shovelfuls of gravel (in Brazil). In China in 2006 a van drove over his arm and hand. He recovered, but wondered whether his luck would last. It ran out on the road between Salonika and Athens this August, where he was knocked out of the way by a car that appeared to be chasing another. At bad moments on his trips he had sometimes distracted himself by thinking of Devonian scenes: green fields, thatched cottages and daffodils. He would return to a nice house, a bit of garden, the job. But that thought could never hold him long. Although his body might long for the end of cycling—a flat seat, a straight back, unclenched hands—his mind was terrified of stopping. And in his mind, he never did. Listen to a tribute show here.